Reading medieval and Renaissance documents can be challenging for the modern reader. Paleographers tell us that the written word developed slowly as a poor imitation of speech. Early writings would be sounded out by the reader, often aloud, to determine the words of a text. Parchment, and later paper, were expensive, so writing was tightly compressed, often with very little space between words. Conventions were used such as well understood abbreviations (for example, .M. instead of writing out the word “Majesty”), superscript letters (“w” with a superscript “t” for “with”), the use of dashes or wavy lines to indicate omitted letters (such as “demād” for “demand”). (Examples are given for the English reader; different languages had their own conventions.) The “minim,” or single downstroke, was used to form several letters, including i, m, n, and u; words containing numerous of these letters could often be difficult to decipher. Punctuation developed slowly. The use of an initial capital at the beginning of a sentence and a large capital at the beginning of a paragraph helped to organize the text into complete thoughts. Later additions included various combinations of dots to indicate separation of words or sentences, slashes to show where the reader should pause for breath, and evolving techniques for indicating that the writer was conveying a question. 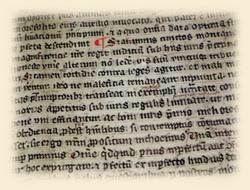 Creating Alfred’s chronicle accurately for the time period would prove challenging for both writer and reader. However, in an attempt to achieve some modicum of authenticity, I have chosen to present the chronicle devoid of modern punctuation, using only the initial capitals and large capitals to delineate sentences and paragraphs. It is my hope that this will give the modern reader a glimpse into the nature of early texts without trying his or her patience too severely. Readers interested in pursuing this topic further might consider starting with the website of the National Archives (Kew, London, Surrey, UK) (http://www.nationalarchives.gov.uk/palaeography/default.htm), which provides an informative tutorial on paleography.